Living as one should– Gluten Free. My Cookbook Just For You. BEST GF Eats In Texas, so Far. Can you find the horny toad? 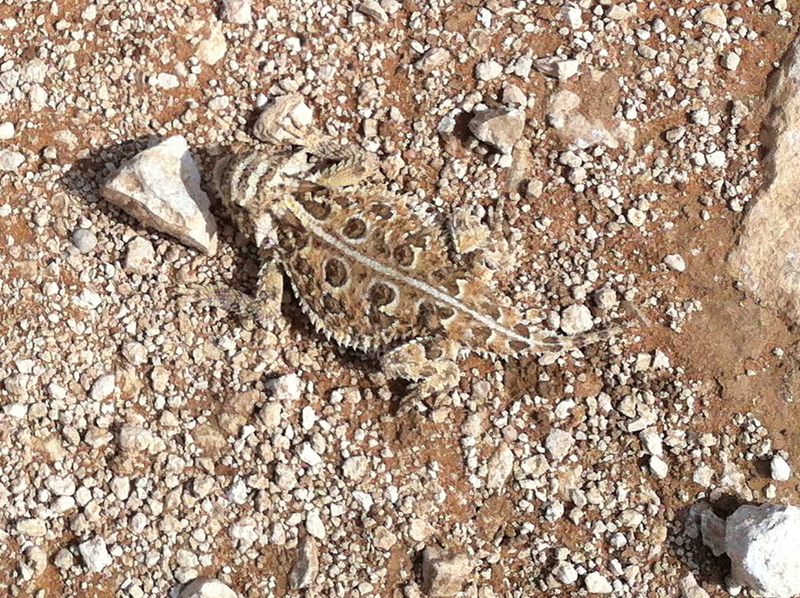 For you non Texans, this is a ‘Horny Toad’ or the books call em Horned Toad of Horned Lizard. Texans call em Horny Toads. They come in all sizes, this is a medium size, I know because I took the picture. The babies are insey, and cute. I found one that was like half an inch across and long, it must have been ‘fresh’ out of it’s egg. Supposedly, their favorite food is ants, then other bugs, ie grasshoppers, spiders and such. They shoot blood from their eyes, though I have never ever seen it happen. When I was a kid I would catch these guys, try to get a ‘family’; Momma, Daddy, big brother and baby, carry them around, especially the baby, then let them all go at the end of the day. The Horned Toad conservation Society (Yep there is one) says that Horned Toads are on the conservation list in Texas. It is illegal to catch and keep.You can catch an look, but don’t keep them and breed them. I wonder if they actually are ‘endangered’? Or is it they just are not seen well? They do blend with the rocks and dirt. Where we are,they are everywhere. I see at least 2 everyday I walk my trail, that goes around our 10 acres. I don’t calculate, but I bet if someone did, they would formalize something that multiplied the feet by the acres by the horny toads and the birthing cycle and would find we have an abundance of horny toads. I don’t think ‘they’ are looking in the right place. And even when they do, they may not see what they are looking for, because of the camouflage. ‘They’ say that the population is disappearing because we bad humans are killing ants’ thus horny toads food source. (Sounds like ant’s may be endangered also). Also building houses and such are removing their environment. Then predators (food chain) are eating them. I don’t buy it. The pancreatitis being a possible effect from gall bladder issues, can be found on the internet, so I am guessing, text books. Stomach pain can be pancreatic. So quick conclusion young 8 year old boy needs his gall blader removed. REALLY? Could they possibly be not seeing something, something camouflaged? Are they ignoring some other facts. pancreatitis Malabsorption issues from Celiac/Gluten intolerance can bring this on. Could the Doctors be ignoring what is obvious, because it blends with something else? Like a horny toad on a rocky road? They are treating the symptoms, yet not really looking for the cause. Why does an 8 year old boy have pancreatitis or gall bladder issues this severe? The pancreas and gall bladder receive their ‘function’ from other sources in the body; digestion, immune system, absorption of nutrients. We seem to think the ‘They’s’ of this world, because they ‘say so’ must know so. They may not. Looking for Celiac in wrong place..